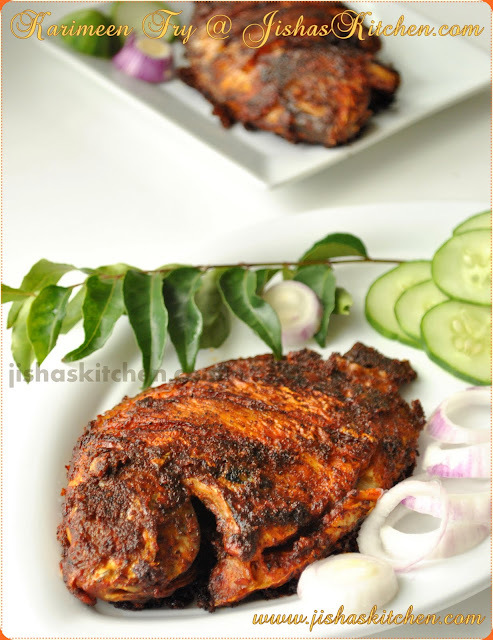 Today I am sharing the recipe of Karimeen pollichathu / Pearl spot fried in plantain / banana leaf, which is a toddy shop / house boat specialty and it is very popular among malayalees. This dish is prepared by frying fish by wrapping it in banana leaves and if you dont have banana leaves then you can even use aluminium foil. First clean the fish and using a knife make 3-4 gashes on each side of the fish. Then make a paste of red chilli powder, black pepper powder, turmeric powder, vinegar and salt and then marinate the fish with this paste and refridgerate it for about 30 minutes - 1 hour. Then heat just 2-3 tbsp's of oil preferably in a non-stick pan and fry the marinated fish in a low flame for about 2-3 minutes per side. Then transfer the fried fish to a paper towel. Now we need to prepare the masala for fish, so heat little more oil in the same pan and add mustard seeds. When the mustard seeds crackle, add curry leaves followed by chopped ginger and garlic, chopped green chillies and chopped shallots and saute till shallots become soft. Then lower the flame and add kashmiri chilli powder, black pepper powder, turmeric powder, fennel powder & fenugreek powder, and fry till the raw smell of the powders go. Next add chopped tomatoes and little salt and fry till the tomatoes are nicely mashed and cooked and then remove the masala from the flame. Then take clean plantain leaf and cut into medium to large sized pieces, but do make sure not to use the stem. Then singe the banana leaves over an open flame, this will make the leaves soft so that it wont break while wrapping. 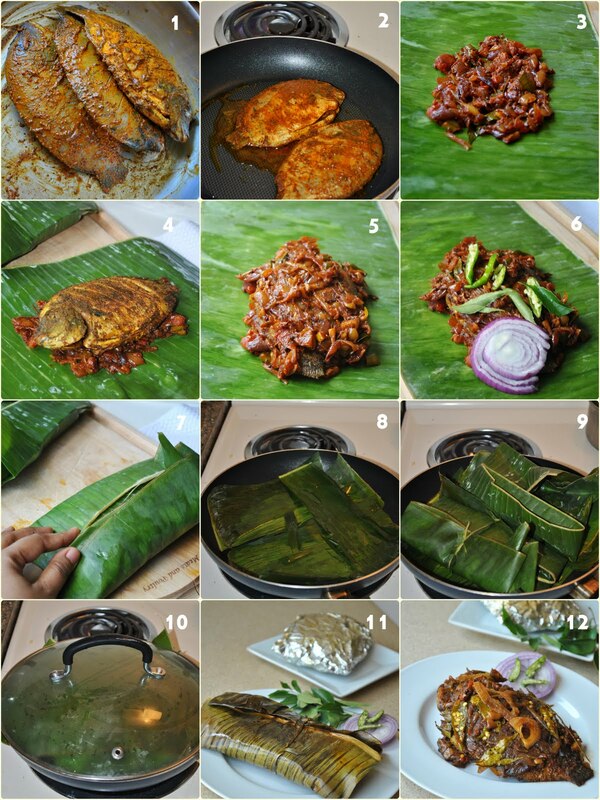 Then first place a layer of masala on the center of the banana leaf and place the fried karimeen / pearl spot above the masala and then again place another layer of masala on top of the fish. Finally place some sliced green chillies, sliced tomatoes, curry leaves and sliced onions on the top of it and wrap the fish tightly using the banana leaf and tie it with a thread. Then take a deep pan and heat 2-3 tbsp of oil and then first place some plantain leaves in the pan and then place the wrapped fish in it and cook covered in a low flame for about 20 minutes, ie 10 minutes each side and remove from the flame. Fish preparation looks amazingly delicious. Excellent clicks as well. All time favoruite..I think Karimeen is like our regional official fish..hehe..looks authentic and came out perfect Jisha dear ! my fav/.. when ever we go to kerala my dad will find a restuarant which has good karimeen pollichattu...it's our family fav,but we don't do it in our home...but thanks for the recipe @ the right time...my parents are coming to visit me in next few days will make this for dad..thanks a lot.. This is awesome!!!! Im drooling! Karimeen adipoli aayittundu. Loved the crispiness and colour...Slurp! OMG Jisha!!! These are done so perfeclty with the banana leaf & all!!! Lovely clicks!! Seriously am inviting myself to ur place, karimeen pollichathu looks extremely irresistible and salivating..
Yummy yum karimeen pollichathu..took me back to kerala..
Sooopper delicious.... Lovely clicks too..
Ithu ethra kittiyalum enikku kodi theerilla...ahhh! Looks totally mouthwatering Jisha! This looks excellent dear..had this quite long back..looks fabulous..
WOW~ I’m really intrigued by this recipe, very authentic n beautifully executed! It looks really delicious. I bet the foil/banana leaf holds in all those spices and moisture really well. Wow what a tempting recipe.Looks so inviting and mouth watering presentation. It,really so nice i am also made this one simply supereb taste. I always make fish pollichathu using your recipe and it turns out to be super yummy every time I try it. I use aluminium foil for the preperation. It is a bit time consuming for me but the end result is a real WOW. 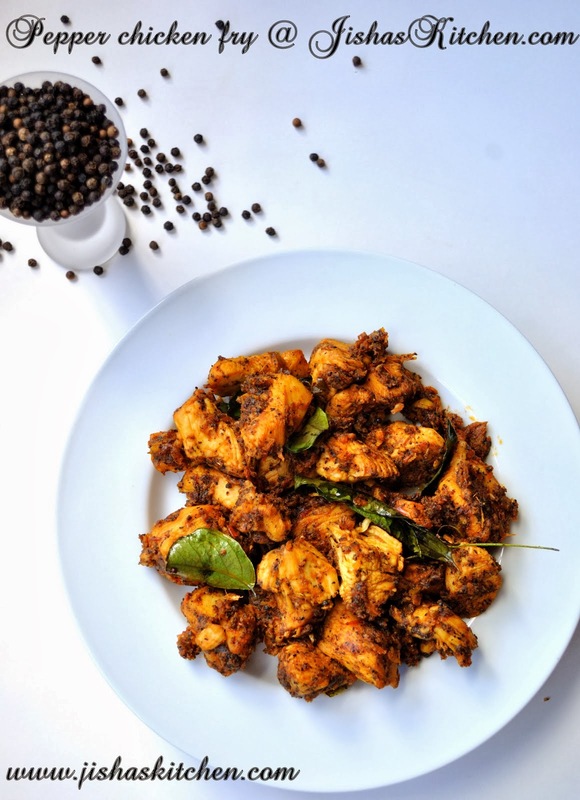 Everyone attempting fish pollichathu should definitely try this recipe. Thankyou Jisha for sharing your recipe with us. May God bless you and your family.